UNCTAD is the go-to source for information about foreign direct investment, and its World Investment Report 2014 has the most recent numbers. To be clear, the definition of FDI "refers to an investment made to acquire lasting interest in enterprises operating outside of the economy of the investor," and where "the investor´s purpose is to gain an effective voice in the management of the enterprise." A common practice is to use "a threshold of 10 per cent of equity ownership to qualify an investor as a foreign direct investor." FDI is usefully distinguished from "portfolio investment," which is foreign investment that is purely financial and does not involve a voice in management and may be quite short-term. Global data on portfolio investment is collected by the IMF. 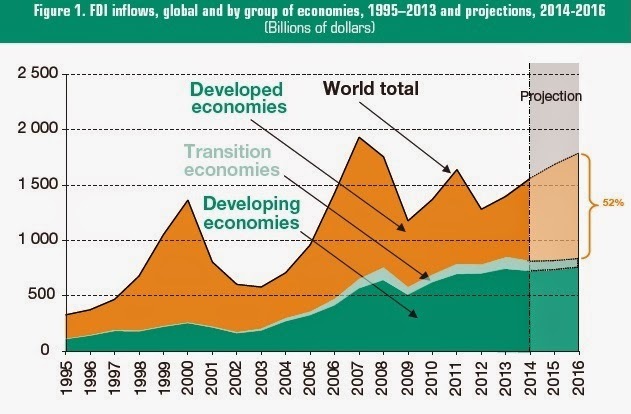 Here's the pattern of FDI since 1995. The "traditional pattern" of FDI, as the report calls it, has been that developed countries received a greater share of such inflows than developing countries. But as you can see, the inflows of FDI to developed economies have been fairly volatile, while the inflows to developing economies have been rising more steadily. The "traditional pattern" is gradually shifting toward the developing countries. Total FDI for 2014 looks to be about $1.6 trillion. For 2013, total stock of foreign direct investment around the world is about $26 trillion, total income is about $1.7 trillion, which works out to a rate of return of about 6.5%. About 70 million people around the world are employed by foreign affiliates of companies based elsewhere. Here's a more detailed breakdown of FDI inflows and outflows. To me, one of the facts that jumps out is the preeminence of the U.S. economy in foriegn direct investment--it leads the way by a wide margin in inflow and in outflows. In a globalizing economy, the deepening of these interrelationships of U.S. firms with firms around the world should be viewed as a considerable strength. In looking at the rest of the FDI inflows, it's interesting to me that no EU country shows up until Spain (#9 on the list). 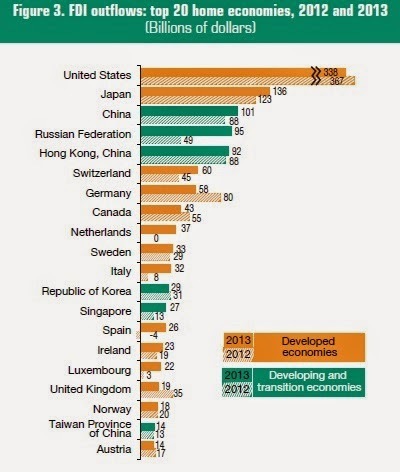 It's also notable that after developing and transition economies are so well-represented on the list of FDI inflows. After the U.S., the next few top countries for FDI inflows are all developing and transition economies. I would not have guessed off-hand that FDI inflows to India exceed those for Germany, nor that FDI inflows to Chile and to Indonesia would exceed inflows to Italy. In looking at the rest of FDI outflows, the developing and transition economies are less well-represented, as one might expect. Less emphasis of FDI on extractive industries in low-income countries. "Although historically FDI in many poor developing countries has relied heavily on extractive industries, the dynamics of greenfield investment over the last 10 years reveals a more nuanced picture. The share of the extractive industry in the cumulative value of announced cross-border greenfield projects is substantial in Africa (26 per cent) and in LDCs (36 per cent). However, looking at project numbers the share drops to 8 per cent of projects in Africa, and 9 per cent in LDCs, due to the capital intensive nature of the industry. Moreover, the share of the extractive industry is rapidly decreasing. Data on announced greenfield investments in 2013 show that manufacturing and services make up about 90 per cent of the total value of projects both in Africa and in LDCs." Shale gas is becoming a perceptible force in global FDI. of energy firms based in other countries rich in shale resources." Private equity is less involved in global FDI, and tends to focus mainly on FDI in high-income countries--although this could change in the years ahead. "In 2013, outstanding funds of private equity firms increased further to a record level of $1.07 trillion, an increase of 14 per cent over the previous year. However, their cross-border investment – typically through M&As – was $171 billion ($83 billion on a net basis), a decline of 11 per cent. Private equity accounted for 21 per cent of total gross cross-border M&As in 2013, 10 percentage points lower than at its peak in 2007. With the increasing amount of outstanding funds available for investment (dry powder), and their relatively subdued activity in recent years, the potential for increased private equity FDI is significant. Most private equity acquisitions are still concentrated in Europe (traditionally the largest market) and the United States."